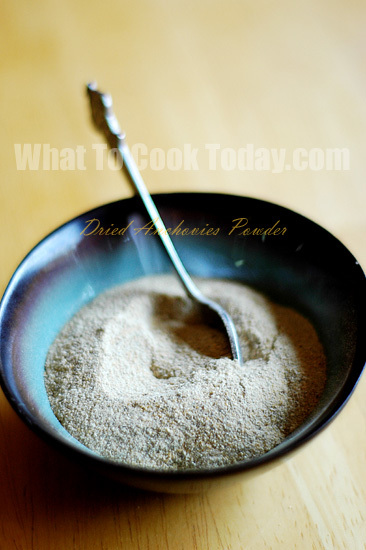 I had been wanting to make this dried anchovies powder for a long time, but didn’t get a chance to, until recently. My mom got this recipe from her friends and so I went ahead and gave it a try. Dried Anchovies or known as Ikan Teri in Indonesian Language or Ikan Bilis in Malay, are very popular ingredient widely use around the Asian kitchen. 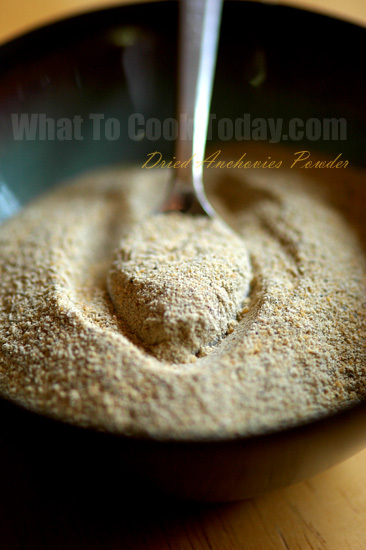 Deep-fried it to make Anchovies with chili sauce, or use it to make stock, or as toppings on different dishes, or in this case use it to make anchovies powder. The dried anchovies have strong taste due to the curing process. Fresh anchovies, which are often used in European cooking, are much more milder and less salty. Anchovies do come in variety of sizes and also available in fresh and dried forms. Some people also wonder if anchovies have any nutrition value. As you can see that anchovies mostly comes intact in one piece (head to tail), though there are also with head and tail removed already and bones are still intact. Anchovies with bones intact are a good source of calcium. Of course, I’m not recommending that you must eat anchovies in order to get your calcium. Caution also need to be taken with anchovies, because it does contain Domoic acid, which can accumulate in marine organisms such as shellfish, anchovies, and sardines that feed on the phytoplankton known to produce this toxin. So, always wash your anchovies before you use it, especially if using the dried anchovies. It also helps to get rid of the saltiness. Next question is, why makes it into a powder form ? My niece has been having her bowl of porridge with dried anchovies powder since she was an infant. Her nanny often prepare the home-made anchovies powder for her and store it in a little container and it lasts for a month at least. I had a taste of it and boy…I loved it too. A little sprinkle of the powder does go a long way. 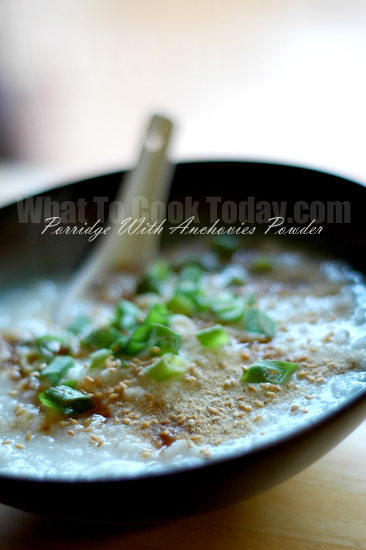 The dried anchovies powder does make a nice condiment on porridge, soup or any dishes you want to add it on for extra flavor.